This was a wrongful death personal injury involving the death of Ernestine Shepard, who died just 16 hours after her aorta was torn in a hit-and-run auto accident. The auto accident involved a flatbed tractor trailer truck that was stopped for a prolonged period on a major street in downtown Petersburg. The hit-and-run driver rammed Ms. Shepard’s pickup from behind, propelling it into the illegally parked tractor trailer. Cuthbert Law Offices settled with the hit-and-run driver (who had only a modest insurance policy) and went after the driver of the tractor trailer and his employer (who had a huge insurance policy). The jury returned its verdict against the driver of the tractor trailer and his employer. The verdict totaled $1.7 million, plus interest. The trial judge reduced the total award by more than $1 million. On appeal Cuthbert Law Offices argued that the trial court abused its discretion in finding the jury verdict was excessive and in cutting the prejudgment interest to zero. The Supreme Court of Virginia agreed and restored the jury’s verdict. 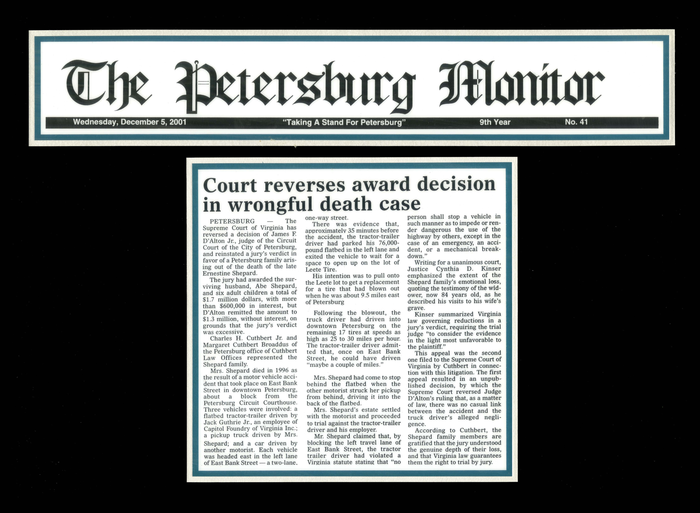 This is the second largest verdict ever obtained in Petersburg Circuit Court (the largest having been obtained by Cuthbert Law Offices in the case of Pulliam v. Coastal Emergency Services of Richmond, Inc).